IT IS BETTER TO LIGHT A CANDLE THAN TO CURSE THE DARKNESS. Home and family are the key to a happy and healthy nation; HAND-WASHING,SAFE WATER,SMOKE-FREE COOKING-STOVES,LED-LIGHTS to improve lives of poor and BELOW POVERTY LINE[BPL] families living in huts and hovels are some of the issues that this blog will address;no-cost or low-cost stand-alone solutions will be in focus. -100,000+ hours of bulb life. -Burns 100 times longer than standard Torch light. -500+hours of pleasant light with one set of three AA size batteries. -Flat bottom for positioning upright. I have used this light for over six months and found it meets all the above specifications. A family can buy three torches over a period of time,one for the family head,one for the house-wife,one for the children and meet all their lighting needs in Rs.225. These pictures show the use of the torch for reading;the torch can be hung from the roof five feet above the book as in the second picture or held in hand as in the others. -causes indoor air pollution from smoke and other gases and a leading cause of death;over 500,000 die every year from indoor air pollution[IAP] in India. solar powered lights with LED[light emitting diodes]bulbs are a good alternative to kerosene lamps;these bulbs last for over 100,000 hours;very efficient in light production;however solar powered LEDs run on rechargeable batteries which are costly and not available in our villages;and most such lights in the market are in the price range of Rs.750 to Rs.3000;far above the means of the poor. A very low cost alternative is the Led torch/flaslight from ANDSLITE for Rs.75/- including the batteries; it gives adequate light for cooking,reading and is sturdy and portable ;it can be used for three to four hours daily for over hundred days on three AA size batteries;these batteries used in transister radio are readily available in all villages for Rs 7/- each or Rs.21. INSULATION-The rocket elbow and its surrounds should be made with good insulating material;Good insulation is made of tiny pockets of air separated by lightweight non-conducting material.Soil or clay used in traditional stoves is dense and heavy and does not make for good material for stoves;a lot of the heat is absorbed by the stove itself.Using bricks made from a mixture of clay and saw-dust/ rice-husk / hay from paddy stocks will make a good material for rural areas;mix clay and saw-dust,knead saw-dust into the clay thoroughly,then add water;the bricks from the kiln should float in water. URBAN AREAS-A portable stove which can be used indoors or outdoors as shown in the videos here can be made with used tin cans and insulation of facing/surface fire tiles/bricks available in the market. the smoke and speed up the draft. coals. Avoid allowing too much extra air in above the fire to cool it. chimney should all be about the same size. 8. Use a grate under the fire. 10. Maximize heat transfer to the pot with properly sized gaps. -the pot skirt ensures heat transfer to the pot both at the bottom and the sides. -A long combustion chamber prevents smoke but reduces heat to the pot; a short chamber provides more heat but may generate some smoke. -the gap between the pot and the skirt should be around twelve millimeters to ensure efficient transfer of heat to the pot;heat escapes with a large gap;if the gap is too narrow it restricts air flow. - wood burns only at the inner end and it should be pushed in as it gets whittled down in burning. Based on these principles several stoves have been designed to cater to all segments of the users;a ready-made stove ENVIROFIT is available in souther states for prices varying from Rs.700 to 2800.we could also build stoves for as low Rs.50 to 100 using local material like in 'Good-stove' ; after a survey of improved stoves the World Bank stated that models that can be constructed by the people with local materials are the ones that are easy for adoption.Stand-alone models are the best for urban poor and for all rural areas. The stove seen in the picture is made from a tin can;a 4"x4" window is made on the side near the bottom to place the firewood and a grate on the top to hold the pot all for Rs.6 !cooking is done in the open to avoid smoke in the hut. 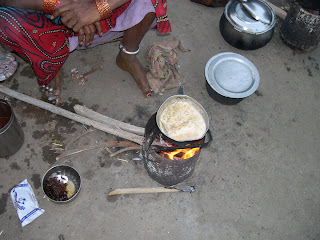 However biomass burning creates indoor air pollution which kills one person every twenty seconds[WHO];India accounts for 80% of the 600,000 premature deaths that occur in south-east Asia annually due to exposure to IAP.The World Health Organisation estimates that pollution levels in rural Indian kitchens are 30 times higher than recommended levels and six times higher than air pollution levels found in New Delhi. secondly the traditional open stoves are very inefficient and consume high quantity of wood or other biomass. 1.complete burning of the wood is achieved by providing for adequate air supply into the combustion chamber;proper burning of wood reduces or eliminates smoke. 2.By providing good insulation to the combustion chamber loss of heat is prevented. 3.The heat is efficiently transferred to the vessel/pot by providing a skirt round the vessel. these details are presented in the figure in the next posting. 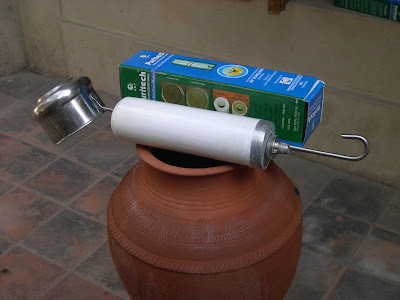 Here you can see the pot water filter;the filter candle is placed in the top pot and the filtered water collects in the bottom pot which has a tap to draw the water.The filter element should be cleaned regularly using a soft brush;it is easy to clean and poses no danger of loosing the nano silver coating.Maintained properly it may serve for two years or more .it can purify water of high bacterial content from well and pond. 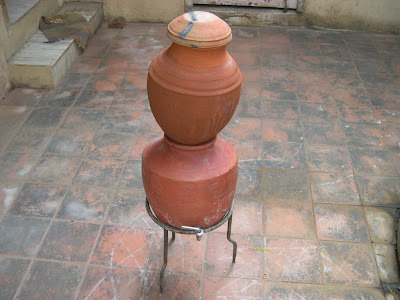 Similat filters called Matka filters were used in Gujarat floods by society for environmental protection[SEP] and peoples health and development trust[PHDT]. HWTS is not a substitute to infrastructure development for water supply;it ensures safe water at the household;the vessels used for storage should have narrow mouth; hands should not be dipped in the storage pot. 1.It is a stand-alone facility and empowers the household to safe water at home. 2.Low cost.The filter candle is the only item to be obtained from the market once in two or three years. DRUMSTICK SEED-drumstick seed powder added to water removes turbidity . STRYCHNOS POTATORUM,NIRMALI,CHILLA-The seed are very hard;the seed may be rubbed on a rough stone with addition of small quantity of water and the seed extract added to water removes turbidity. While drumstick is grown as a vegetable in most homes,Strychnos potatorum occurs in forest areas in most tribal tracts. 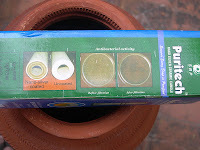 MATKA/POT WATER FILTER FOR Rs.100. 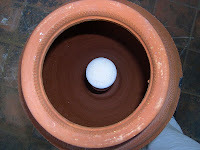 Generally water filter prices range from Rs500 to 2000 in the market;the heart of the filter is the ceramic filter candle;by fixing the candle in the clay pot used in most rural households for storage of water, a low cost water filter can be made as shown in the picture .such filters have been used in flood effected areas of Gujarat and Bihar. "Every year there are 1.6 million diarrhoeal deaths related to unsafe water, sanitation, and hygiene—the vast majority among children under 5. More than one billion people lack access to an improved water source. Numerous studies have clearly shown that improving the microbiological quality of household water by on-site or point-of-use treatment and safe storage in improved vessels reduces diarrhea and other waterborne diseases in communities and households of developing as well as developed countries. Washing hands is the simplest way of protecting ourselves from several infections;"Worldwide, surveys have shown that handwashing alone reduces the instance of diarrhoea by as much as 43 percent.IT also prevents the spread of other communicable diseases. Proper hand washing is not just a quick cold rinse of the hands. It requires 20 seconds of your time, warm water, soap (liquid is best) and some devoted scrubbing. This means washing around tips of fingers, fingernails, and the web, as well as the front and back of your hands. The dirtier the hands, the longer the wash time. Use the towel to turn off the faucet handle. This reduces the risk of picking up bacteria from the handle. These families have come from Nalgonda district to Hyderabad in search of employment. 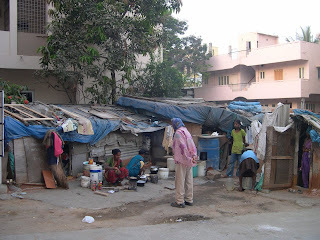 Presently they are working on a construction site as daily wagers.They are living in the temporary huts seen here, constructed near the work-spot. What are the bare necessities for a family? Good, clean, safe water for cooking and drinking; an efficient stove for cooking food; a light in the hut in the evening for two or three hours including for children to study. SAFE WATER,the first priority:These families get their water from a municipal tap in a nearby housing complex; the quality of the water depends on the supply source, its collection and transport and storage container used;often even treated water gets contaminated in transport or storage;after a study of these issues WHO strongly recommends HOUSEHOLD WATER TREATMENT at point of use[POU] as the best measure to ensure safe water for homes..A simple POT WATER-FILTER for Rs100 is described in this blog. The Rajiv Gandhi Drinking Water Mission has been working on providing drinking water to all villages in India;its focus is on infrastructure development;while it is a laudable objective, household water treatment should also be included in its program to ensure safe water at home as recommended by WHO. STOVE:The poor use biomass based stoves for cooking food;these are generally inefficient both in quantity of wood use and quality of fire as it produces more smoke than heat;indoor air pollution kills one person every 20 seconds according to WHO. Improved stoves for below Rs.100 are described. LIGHT:The family in the photo uses a kerosene lantern like most poor in rural areas;several solar lanterns with CFLs[compact fluorescent tubes] or with LEDs[light emiting diodes]are in the market in price ranges of Rs 700 to Rs3000;A LED light for Rs.100 is described !.